Christian Eriksen's first-half strike gave Tottenham their first league win since August as Mauricio Pochettino managed a win over his former club. Possibly overshadowed by the abundance in football action across the capital, Tottenham showed few signs of fatigue from their Europa League meeting with Besiktas on Thursday. From the outset, they looked to push the visitors on the backfoot as Jan Vertonghen's swift header was stopped off the line. Lamela saw his shot emphatically denied before Eriksen saw the same fate. A surging run from Adebayor saw him transfer possession to Nacer Chadli. He then found Eriksen lurking on the perimeters of the box to arrow it low into goal. Southampton's chances came few and far between. Mane came close from Pelle's cross, Wanayama was stopped and frustration was taking its toll. In the late stages as Southampton went all out for the equaliser, Sadio Mane missed the definitive opportunity from close range, sweeping it wide. Tottenham held on, but their concern was a potential injury to Kyle Naughton. Relief reverberated around the Spurs' camp for their win, which adds to victories over West Ham and QPR in the first two weeks of the season. 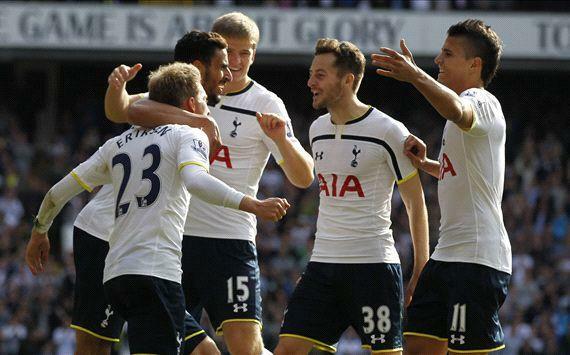 Christian Eriksen's strike lifts Tottenham past Southampton in the Premier League.